The fifth and final Test match of the England-India series is going on at the Oval, and India are fighting a nearly lost cause. The side lost Shikhar Dhawan, Cheteshwar Pujara, and Virat Kohli by the time the score reached just 8, and the hosts may just have tightened the noose on the visiting team to such an order that it is irreversible now. Meanwhile, reports have surfaced that Stuart Broad has suffered an injury, but he is still playing on, as the game has just begun for its final day. India did well early on, reducing England to 198/7 at the end of day one. But things turned topsy-turvy thereon, as the hosts bounced back on day two to eventually end their stint at 332. India's first innings concluded 40 runs short of that and then came out with a second chance to bowl. Alastair Cook - who is playing his last ever game, and Joe Root, in turn, displayed quite a spectacle, as both batsmen made memorable centuries and added 259 runs for the third wicket, pushing the England score to impossible heights. Though India then made some sort of a comeback, that would probably not be enough. At the fall of the eighth wicket at 423 runs, captain Root declared the innings, giving India a target of 464 to win. He did bowl five overs before the end of play on day four, also picking up the all-important scalp of Virat Kohli off the latter's very first ball. But later on, he apparently turned to watch television in his hotel room and subsequently caused an aggravation of his injury, as reported by various sources today morning. As a result, his bowling may also be affected today. But Broad is still playing, and television cameras have been able to pick up a blue taping on his side that can be seen through his shirt. India have not lost a wicket since late yesterday, and are currently at 119/3 from 34 overs. Opening batsman KL Rahul and Ajinkya Rahane are at the crease, trying to chase the daunting target. 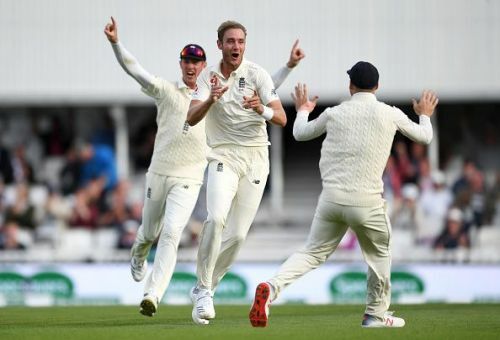 England need seven wickets to complete yet another win in the series, while India need 367 runs to be scored before they run out of these seven wickets. A win would minimize the visitors' humiliation by an overall margin of 3-2.